Since 1977, Brimfield has been the home of May’s Antique Market, known for huge crowds and their unique opening, allowing all buyers to be early buyers. Considerable effort is made to eliminate pre-shopping on the field before the market opens. 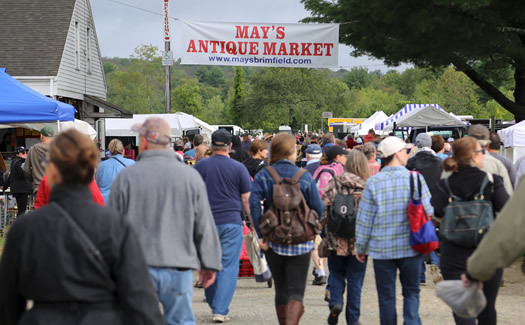 May’s Antique Market in Brimfield, MA offers a strong nucleus of quality antiques and collectibles that brings buyers and sellers from all over the continental United States, Canada and many foreign countries. May’s Antique Market opens at 9am Thursday morning during the week of Brimfield. RAIN or SHINE. Located in the heart of Brimfield Massachusetts, May’s operates three times a year offering the best assortment of antiques and collectibles dealers from all over North America, Canada and Europe. At May’s Antique Market everyone is an early buyer because our dealers wait till the gates open at 9am to unpack their antiques and collectibles. Because of our unique opening style, everyone gets a chance at finding something fresh. May’s loyal base of dealers sign up months in advance to secure their space on the field, many doing so for over 40 years. The buying crowd at May’s remains strong, many have built up strong collections of unique and hard to find items. Some shoppers stop by the office to say thank you. They emphasize how important it is that we keep our Early Buyer concept alive, so that is what we continue to do. “At May’s, everyone’s an early buyer” is the slogan of May’s Antique Market, one of the oldest shows at Brimfield. Since 1977, a unique policy has guided the show’s allure, prohibiting dealers from setting up until the opening bell. This ensures that the best merchandise is available to everyone who stood waiting in line. We look forward to seeing you at May’s Antique Market! Are you a antique dealer who is interested in setting up at May’s Antique Market? Please use the form on this page or the information below to start the process.